Published by Bat Conservation International, this book is probably the most referenced book about building bat houses. Bat Conservation International - "Bats aren't blind, they're not rodents, and they won't get tangled in your hair. The truth is that bats are among the most gentle, beneficial, and necessary animals on earth. But because of centuries of myth and superstition, they are also among the world's least appreciated and most endangered animals." B4UBuild a bat house, be sure to visit this very informative site, which includes pictures of bats, facts, trivia and information about bats, as well as, a simple method of removing a colony of bats from your house. Bat Conservation and Management - This Pennsylvannia company will help you remove bats from your house or attract bats to a house built especialy for them. 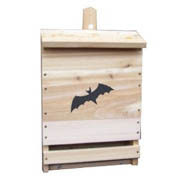 They offer three and five chamber bat houses, bat house kits, bat cans, pole mounting kits, books, and plenty of information about bats. Johnson Bat House - Plans for building a 2 foot high bat house using rough sawn 1 x 12 - from the Northern Prairie Wildlife Research Center. Small Bat House - Plans for building a 14 inch high bat house, for small brown bats, using an 8 foot section of 1 x 8 - from the Northern Prairie Wildlife Research Center. North Carolina State University (PDF) - Information about bats, bat habitat and a diagram of a very basic bat house design.